Well, i am still baking in the over. Jellybean gonna be out anytime soon. Im a nervous wreck. Keep us in your dua guys! If anyone of you knows anyone who is finding someone to carry on installment their car, do let me know! To everyone who took the same photography vendor as me (doesnt matter past or existing clients) , can you sent me a private msg on IG @ismawatydewi. I thought of setting up a group on whatsapp so that im able to communicate with the rest. Before getting married, i remember telling Afiq i didnt want a child until our house is ready. That was my plan and he was agreeable to it. I know some people would say, “eh this things cannot plan, nanti betol betol tak dapat baru tau”. Well, you doa for the buruk of course you get the buruk lah. My decision not to conceive was because of financial status. I wanted us to be able to provide for us & our parents first before we can provide for an additional person. Mind you, having a baby cost a lot of money. But you know, things changed. Plans changed. After marriage, all i wanted was to please my husband. So when he said he wanted a child, i dived in with the idea. With open heart, of course. Syukur alhamdullilah, i am now about 14 weeks pregnant. My first trimester was very smooth. Other than the regular mual feeling, i did not vomit nor did my stomach rejected any food. 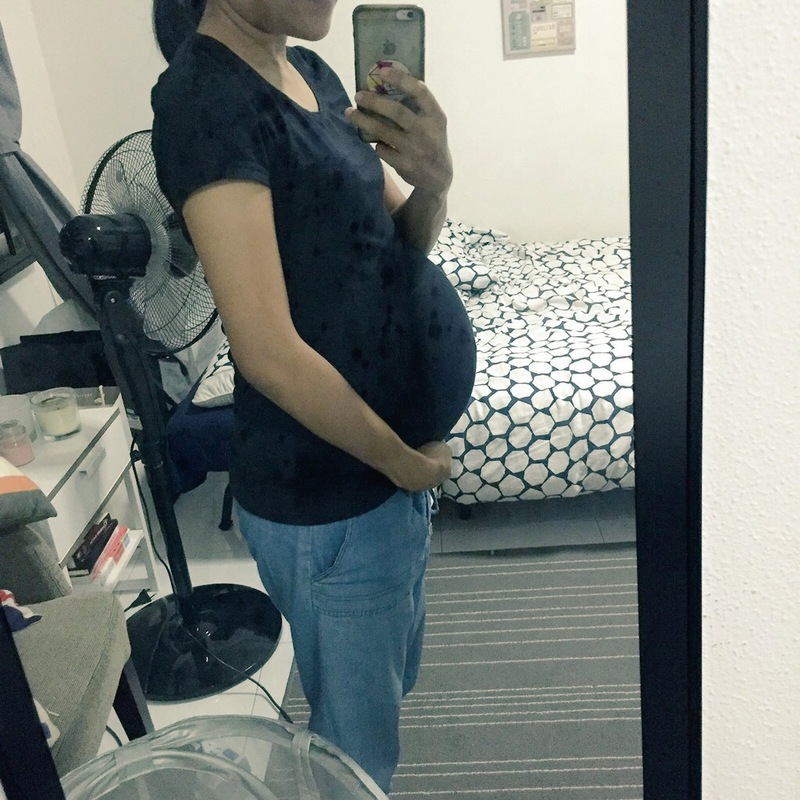 Now in my second trimester, all Jellybean wants everyday is mee hoon soto & pokka ice lemon tea. Anything else i eat will make me puke. It is very torturous!! It can be torturous but i keep telling myself that it will all be worth it after the full term. Ya Allah, grant me the strength to go through this phase & keep us safe from any danger. Amin. We didn’t expect the weather in Brighton to be very sunny. Afiq and me were actually wearing our thickest jacket and as soon as we arrived in Brighton, we were already perspiring. Talking about over confident, hahahaha! I was already quite familiar with the area so finding our AIRBNB was quite easy. Our apartment was in the central and it was really accessible to walk around the town. Before we arrived at the apartment, i was telling Afiq not to expect too much from the apartment. Thats me at the main front door! The owner stated the code number on our booking reference so all we need to do was to press the button when we arrived and we were allowed in! And this is the apartment’s front door! I specifically love how the owner beautify her house with quirky and vintage decorations! Towels and toiletries like shampoo & shower gel were provided but if you are the fussy ones, just bring your own lah. There were also a television in our room, so we had all the privacy we want. Toilets were shared but there wasnt any trouble of using it. The owner was out everyday for work in the morning anyway. If you asked me how was my first experience using AIRBNB, i would say it was awesome and trouble free! I would think you just need to set a lower expectation thats all. Right after the checking in process, we walked to Brighton Pier to have our late lunch. Brought Afiq to the same restaurant that i went to the last time. I had salmon while Afiq had their famous fish & chip! I think we paid about 30 pounds for this meal. If you convert it to SGD, of course hati sakit lah. But in pounds i think it was quite affordable for a restaurant this fancy. The nutella crepe which we ate halfway cause it was very muak! Everything in this store was organic and for a first timer, it tasted quite good! Our first nasi goreng pedas from an indonesian restaurant. Fish & Chip by the beach on our second day. The serving was HUGE for a small eater like me! and enjoying the beautiful weather and scenery…. We couldn’t check in early, so we decided to just leave our luggage at the hotel. We were staying at La Suites Hotel over at Bayswater for that stay. Location was fanstastic but i wouldn’t pick that hotel if i could. My brother and his friends paid for our stay and i think it cost them about SGD$450 per night?! GILE. Anyway… While checking in, the reception asked us how many luggages/bags do we wanna leave behind. Afiq dengan confident nye cakap “4”. But when we counted our bags, we only had 2 luggage & 1 bag! So Afiq was like “EH WHERE’S MY BAG?” I just stared at him in disbelief lah. In my mind I was like, “okay, he’s about to ruin my morning” Hahahaha. To cut the story short, jeng jeng jeng my husband left his bag on the bus you alls! For a while I didn’t know what to do, but smarty pants me told him that we should make our way back to the coach station to try our luck. We didn’t talked to one another through out our journey. Hahahaha. But yes, after all the waiting we managed to retrieve our bag! I think we were surrounded by lucky stars. After all that drama, it was still too early to check in so we went to Mcdonalds (yup again) and coincidentally, one of my good friend, Zakiah, who happened to be in London with her parents whatsapp me to ask if we wanted to join them to Buckingham Palace for the guards changing. We met them at Green Park Station and we walked to Buckingham Palace together. Everything in London is instagram worthy lah! The Changing of Guards was okay lah. I went to see the parade during my last visit to London, so it was nothing spectacular. If you are heading there for your trip, just be there early. The crowds are crazyyyy! We were already tired by then but my uncle wanted to meet us up. We headed back to the hotel to check in, had a very quick wash up (by washing up i mean brush our teeth & wash our face lol!) and then met him at the lobby. We spent the rest of our day walking from Bayswater to Shepherd’s Bush. We were not enjoying ourselves cause honestly we were extremely tired! So we decided to part our ways with my uncle and we headed back to the hotel. The very next day, we left the hotel to catch our train to Brighton. Getting around Victoria Train Station is easy but finding the track to our train was very challenging!! The journey was supposed to take only 50 minutes but unlucky us have to travel on the day when they have track repair works. it was wayyyy cheaper to get the train tickets way in advance! As soon as we arrived in Brighton, this welcome us..
Macam postcard kan? Everything was perfect. The weather was even amazing! I was freezing to death during the last time i was in Brighton!